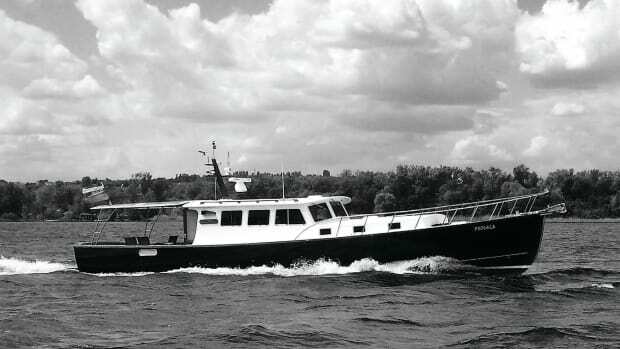 Over the past two years, Arawak, a 1996 Grand Banks Motoryacht, has been undergoing a complete overhaul and refit. She came into port a tired, weather-worn charter boat ready for some major TLC. Arawak’s appointments were outdated, her varnish was peeling, and the hatches were spider-webbed with UV damage. And while she was showing perhaps a bit more than her age due to her tough life as a charter vessel, this Grand Banks had the bones for restoration. 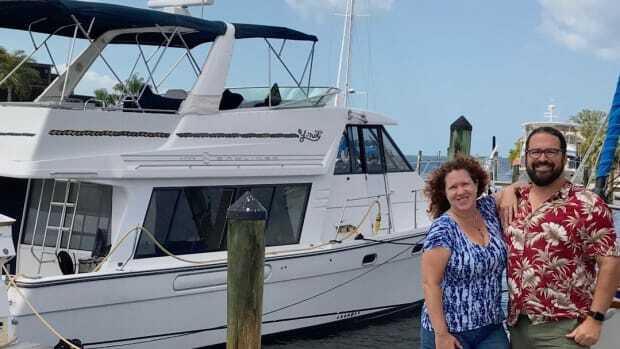 Power and Motoryacht, Soundings, and PassageMaker have been documenting her journey through the My Boatworks website as she has made her transition with the help of several key manufacturers. 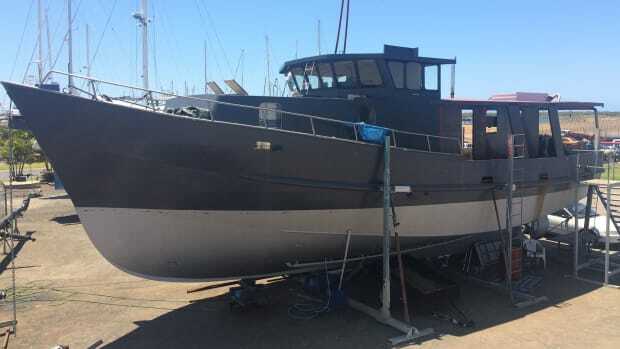 While it has been a long process, Arawak’s refit is slowly coming to a close. The final pieces will come together in Stuart, Florida, including the installation of new heads, refrigeration, generator and rudder packing. Once complete, she will get the green light to return to her hailing port in St. Thomas. Over the past 24 months, she’s seen significant refits of electronics and power, plus aesthetic updates to interior spaces. Now that the paint is fresh and the varnish gleams, she is nearly ready to return home. But before she returns to the Caribbean, we wanted to revisit some of the work she has undergone. An extensive list of Arawak’s projects as well as commentary from sponsors and contributors can be found on Arakwak’s My Boatworks web page. But I thought we would highlight some of the affordable interior restorations that Arawak has undergone. 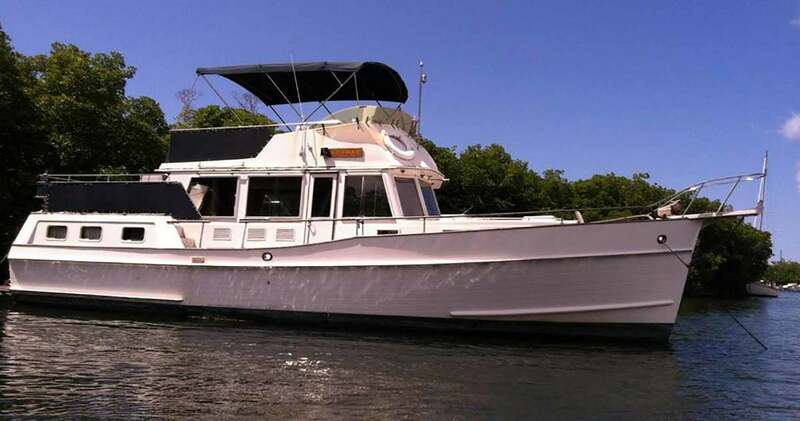 As we head into winter—for those of you who haul out—many of you will begin to plan your offseason projects before cruising season returns next spring. Maybe Arawak’s two-year journey can inspire you, too. Below are details of upgrades that happened to the interior of Arawak, as detailed by My Boatworks. 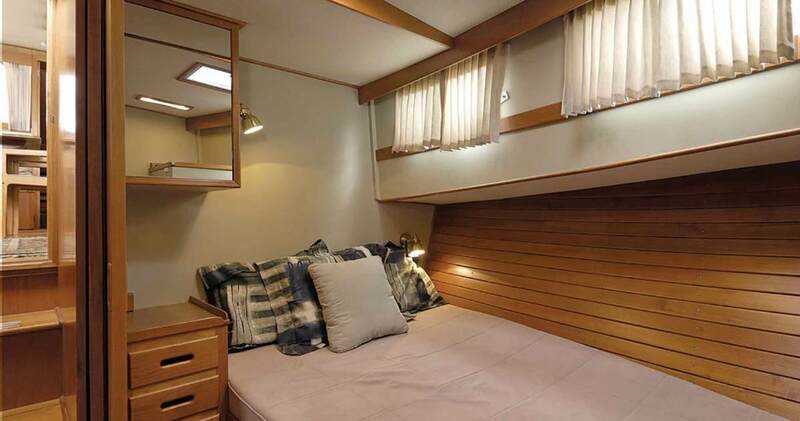 The VIP stateroom of this 1996 Grand Banks 42 is not much different from the original that was introduced in 1966. This traditional V-berth is a set-up more common on sailboats and is actually more comfortable than it looks. 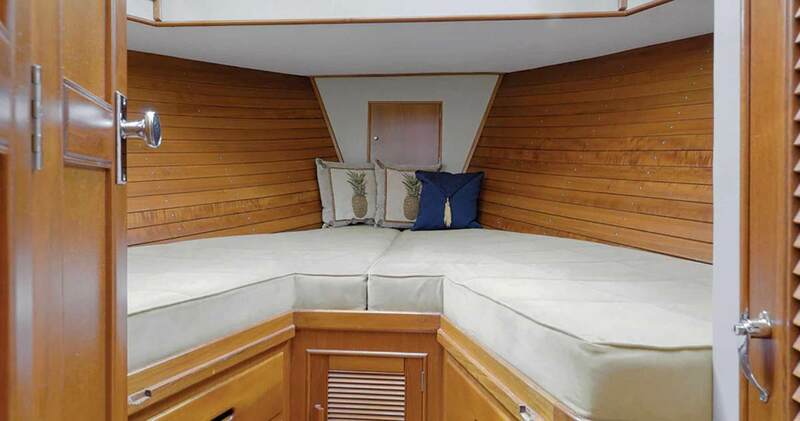 Arawak received a spruce-up of the joinery, new foam for the cushions, upholstery, an overhead hatch from Vetus-Maxwell, and a thorough cleaning. 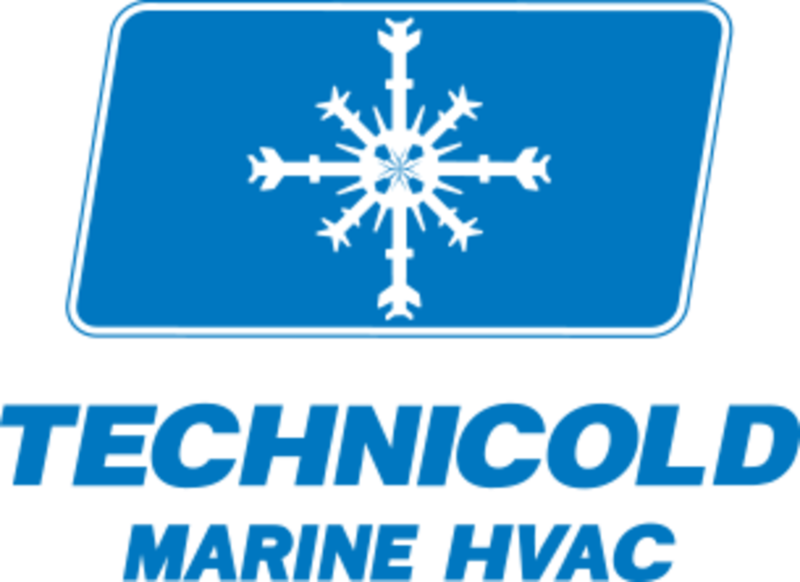 Another component that will improve comfort, especially in Arawak’s homeport in the Virgin Islands, is reverse-cycle air conditioning. One Technicold unit serves the forward section of the boat. Once the new unit is installed, it’s important to incorporate the a/c into the boat’s maintenance schedule. Like the forward stateroom, the portside stateroom will receive a basic freshening up and a new coat of paint on the bulkhead. The overhead hatch will be replaced by Vetus-Maxwell, and the glass in the sliding ports will be replaced as well. A problem arises in this stateroom, and in every stateroom onboard Arawak: Since the mattress usually lies directly on top of the berth platform, there is little to no ventilation space beneath, encouraging condensation. The solid plywood based underneath the mattress was then replaced with horizontal teak slats. Updating and adding to the appliances in the galley is a relatively inexpensive upgrade, but one that is sure to please the onboard chef. But plan ahead. 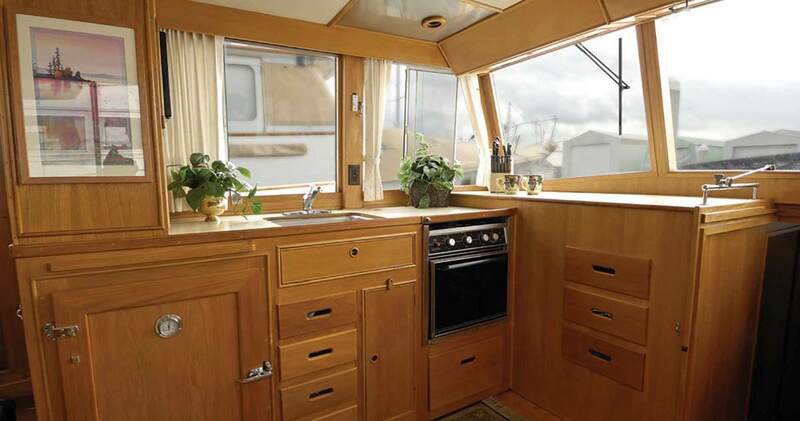 Just putting a microwave or convection oven on the counter is foolish: there is never enough usable counter space on most boats. Better to sacrifice a couple of drawers for an under-counter unit, or find one that combines with an over-the-cooktop fan. Speaking of pleasing the chef, adding a dishwasher is well worth the investment and you can also store dishes and glassware in the unit when not needed. New slim-line versions and drawer models also conserve space. If there’s never enough room in the fridge, consider adding a compact freezer that can be tucked inside the lazarette. So as you start to day dream of the trips you will embark on soon on your trip and you plan your winter projects, consider where some of these simple interior projects can brighten up your boat and give you an enjoyable facelift for a modest cost. 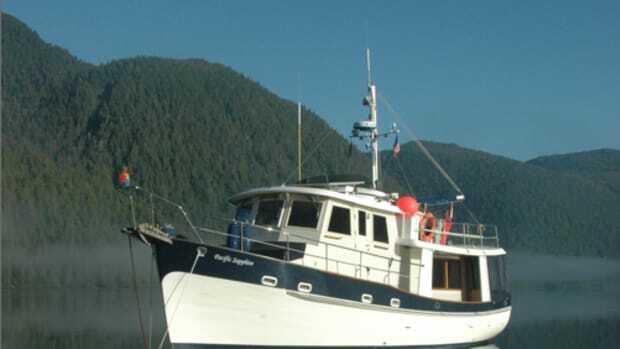 Whether you are a DYIer or are planning a winter haulout, these simple projects will add enjoyment to your cruising experience without sinking your wallet. Stay tuned in the next couple issues of Channels as we revisit some more of the refits that Arawak has undergone. 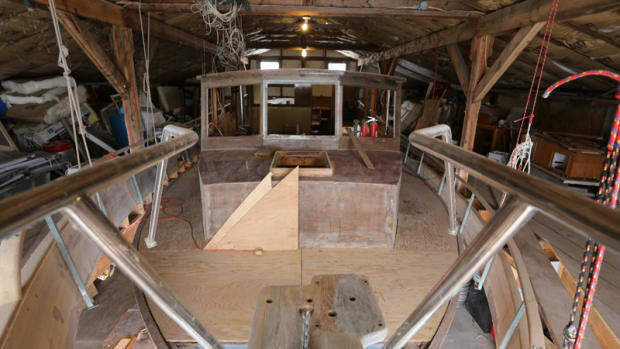 We hope to provide you more inspiration for your future boat projects.